Three great German composers meditate on death and loss, grieving and mourning, memory and comfort. At the interval I overhead one member of the audience remark to his companion: “this must be the gloomiest concert ever”. Though I could see what he meant, and though there was indeed a relatively narrow emotional range to the music we heard, the judgement was, I think, an unfair one. In an excellent book published in 1994, Thomas Connolly discussed a number of Renaissance artists and thinkers in terms of their representation of a process his book called Mourning into Joy. While it would be wrong to claim that the works presented in this concert trace the full arc of the movement from sadness to joy it would be yet more wrong to suggest that any of them leave us entirely in the gloom. The dead children are free of the storms of life and have found another kind of ‘motherly’ home, protected by God’s hand they are liberated from fear. We are still at the relatively early stages of the processes of mourning. Neither text nor music is quite ready yet to move on, as Milton puts it at the close of his great elegy ‘Lycidas’ to declare for future progression: “Tomorrow to fresh woods, and pastures new”; yet text and music are no longer in the grip of ‘gloom’. Connolly, Koenigs and the Orchestra of WNO traced the emotional arc of Mahler’s five songs with fidelity and fair power. Connolly’s phrasing was everywhere beautifully shaped, her diction crystal clear. At almost every point one sensed power held in reserve in her singing; in the mingling of memory, hope and the sense of present loss which makes up the third song (‘Wenn dein Mütterlein’), Connolly’s troubled radiance of voice was intensely moving, and the playing of the woodwinds fused delicacy and strength perfectly. In the interpretation of the fourth song (‘Oft denk ich, sie sind nur ausgegangen!’) there was singing and playing of great dignity, free of the slightest hint of sentimentality; as in any good performance of this cycle one was struck afresh by the extraordinary restraint (one might almost say austerity) with which Mahler uses the orchestra, not least when the orchestral writing provides hints of a kind of comfort not yet evident in the words sung. Perhaps only at the beginning of the final song (‘In diesem Wetter, in diesem Braus’) did the performance become unduly rhetorical, when the work’s extraordinary balancing of the public utterance of private sentiments was momentarily lost. But as the last song progressed, the movement into repose, into the calm that follows the storm, was beautifully articulated. Some partialsense, at least, had been made of the experience of loss. This wasn’t the most emotionally searing performance of Kindertotenlieder, but it was one that breathed emotional truth and musicality. Schoenberg’s A Survivor from Warsaw is essentially ‘public’ in its concerns (though it certainly had its origins in an intensity of personal feeling and experience). The subject here is not the parental loss of two small children, but the Fascist destruction of the Warsaw Ghetto. The narrator’s account of events (the role was played by David Soar) is supported and, one might say, illustrated by orchestral writing of considerable power; but aesthetically the results are almost too immediate, too graphic, to be entirely successful, for all the efforts of the performers. Only when the Male Chorus enters does the work achieve a more than ‘documentary’ power – the Jews who have survived, however precariously, the onslaught of the Fascist soldiers sing the ‘Shema Yisroel’, a powerful expression of faith and of the Love of God as well as an injunction “to teach” such sentiments “to your children”. 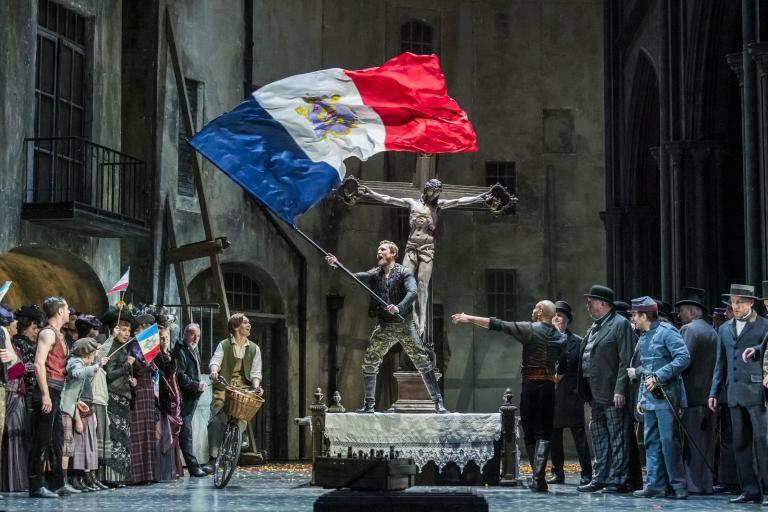 The men of the WNO’s chorus asserted themselves impressively at the work’s close, in defiance and assertion of continuity and survival, of the final power of love over evil; we might have been far from ‘joy’ here, and the ‘comfort’ on offer was modest, but there was the sense that some kind of candle had been lit. Earlier there had been moments of imprecision in some of the orchestral playing, but it was good to hear a performance of this intriguing, if less than wholly satisfying, work. The second half was taken up by a performance of Brahms’s German Requiem. This is a work which undoubtedly contains much moving and beautiful music, but which I have always felt lacked a certain sense of argument and momentum. Brahms arrived at the ‘finished’ state of the work by a series of additions over a number of years – and it shows. As it stands there are 7 movements. There could be fewer (it was originally performed with 5 and then with 6 movements); if another movement were inserted into the current 7 one might not feel it as intrusive. The work doesn’t, for me, have that sense of absolute formal necessity, of being a structure in which everything is needed and to which nothing could be added (or indeed taken away) without irreparable damage being done. On all the occasions on which I have heard the work performed live, some members of the audience have ‘felt’ that the work was finished at the end of the fifth or sixth movement and begun to applaud, and one can understand the error. But, for all that, there is much that is beautiful here. From the opening of the first movement the blend of voices in the chorus was impressive and throughout this demanding work they sang with pleasing dynamic variety and sure intonation, even if at times their diction left a little to be desired. Chorus Master Stephen Harris certainly deserved the warm applause he got at the end of the performance, as did his singers. The Orchestra were at something like their best in, for example, the second movement, the vigour and vitality of their work through much of the movement complemented by the eloquent quietude of their playing at its close. In the third movement (a classic nineteenth century exploration of the dilemmas of Faith and Doubt) David Soar was in generally good voice (though with one or two brief moments of uncertain pitch) and sang with appropriate authority. The fourth movement’s calm was well articulated, although there are surely greater spiritual depths here than were fully found on this occasion. Laura Mitchell’s voice floated attractively above the orchestra in the fifth movement, the balm of consolation beautifully lucid and tender. This was the first time I had heard Mitchell, who appears not to have an especially large voice, but one that is pleasingly clear and which she can handle expressively. Brahms’s orchestral writing is at its loveliest in this movement and Koenigs and the orchestra responded well, producing some of their finest work, lyrical and warm without being too heavily lush. The sixth movement is in many ways the most ringingly affirmative in the work, and there was a rich confidence to the interpretation it got here; there were moments when the Chorus were pushed to their limits, especially in some of the fugal passages, but they very largely met all the demands made on them. The final movement brings us back, tonally speaking, to where we began (F); the words of the final section also echo of the words of the first; the sense is not so much of the completion of a journey of discovery, as of a final confirmation, of a final making explicit, of something already known at the commencement of the work. There is, thus, little sense of triumph in the music – little sense of a victory achieved – but a profound sense of returning ‘home’, of repose, or as the words from Revelation set by Brahms put it: “Blessed are the dead, who die in the Lord, from henceforth. Yea, speaks the Spirit, that they rest from their labours; and their works follow after them”. The mood was captured very well by Koenigs and his forces. We might not quite have moved from ‘Mourning into joy’, but we had certainly escaped ‘gloom’ by the end of the evening.